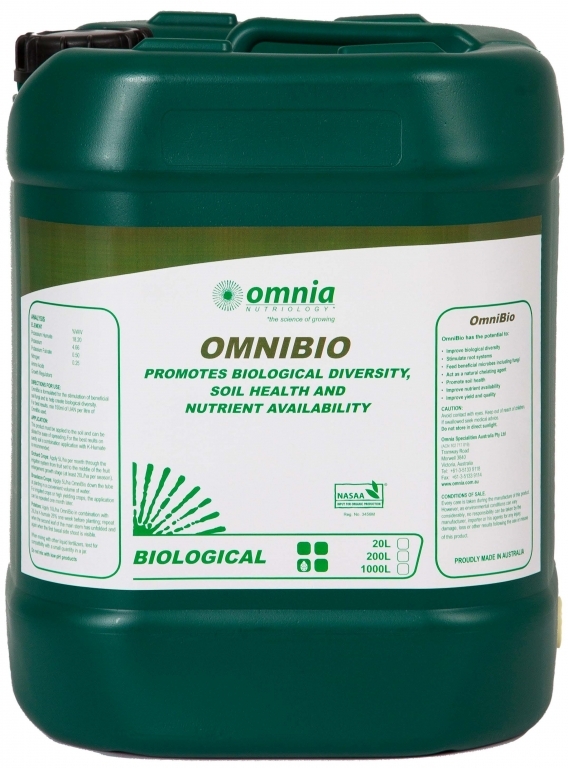 OmniBio has been scientifically formulated to feed specific beneficial microorganisms in the soil and encourages microbial diversity. Fungi and other beneficials prosper and spread through the soil bringing water and nutrients to crops that might otherwise have not been available. Improving the microbial diversity also means increasing beneficial biological predators making the soil environment more balanced and significantly reducing diseases and other harmful pathogens. Reducing disease and improving nutrient uptake means plants have more energy for growth and production. This product must be applied to the soil and can be diluted for ease of application. For the best results on sandy soil a combination application with K-humate is recommended. Apply 5L/ha OmniBio down the tube at plating in a convenient volume of water. For irrigated crops or high yielding crops, the application can be repeated one month later. Apply 10L/ha OmniBio in combination with 20L/ha K-humate 26% one week before planting; repeat when the second leaf of the main stem has unfolded and again when the first basal side shoot is visible. Apply 10-20L/Ha up to 3 times through the crop life. Omnibio is a NASAA-Certified organic product of choice.